She hopes that France’s politics follow suit. 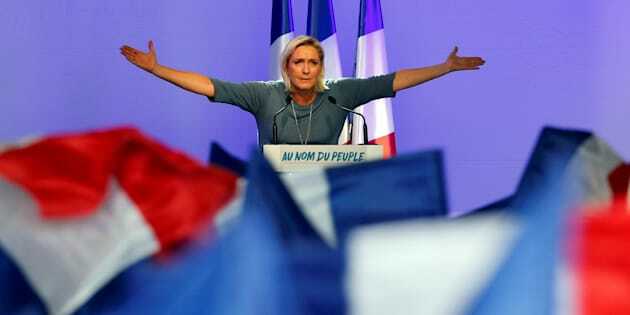 Marine Le Pen, French National Front (FN) political party leader, gestures during an FN political rally in Frejus, France, September 18, 2016. LONDON, Nov 13 (Reuters) - Donald Trump’s U.S. election was a victory of the people against the elite, France’s far-right leader Marine Le Pen said on Sunday, adding she hoped the French would follow suit next year and make her president. Opinion polls show National Front leader Le Pen likely to win the first round of voting next April but lose the runoff in May to whoever should be her opponent. “So if I can draw a parallel with France then yes I wish that in France also the people up-end the table, the table around which the elites are dividing up what should go to the French people,” she said, according to a translation into English provided by the BBC. Le Pen said she hoped all EU citizens could get the chance to express their views on the European Union through a referendum like Britain’s June 23 vote, adding that “the elites would be in for another surprise” if they did ask the question. “We’d better, if we want a powerful Europe, negotiate with Russia, and have cooperation agreements with Russia, commercial agreements with Russia,” she said, adding that it was the EU that was destabilizing Europe, not Russia.